A butterfly-themed wedding is an original choice. This wedding theme is packed with clever design ideas and helpful tips guaranteed to make your ceremony and reception fun and memorable. 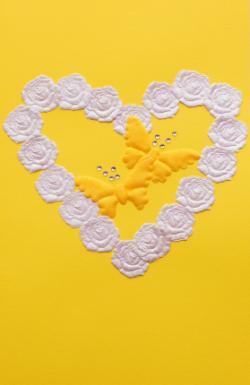 A butterfly wedding is perfect for spring or summer. To keep your bridal party looking fresh and springy, keep the looks light and colorful. If you are having your wedding based on all kinds of butterflies, choose pastel or bright colors for the bridesmaid dresses. Should you prefer a certain kind of butterfly over others (like a Monarch), then choose colors based on that (shades of orange and black). The flower girl dress offers the most options for incorporating a butterfly theme. You may find some little girls' dresses that have butterflies embroidered on them, or choose a simple white dress and place wings on your girls' backs. Men's clothing should match the bridal party colors as well. Informal wedding attire might include a tie that features butterflies. More formal wedding attire could do traditional tuxes, but have a small cloth butterfly pinned into the boutonniere. 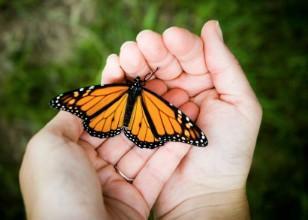 A popular trend of releasing butterflies at weddings may sound like a good idea. You may have the photo of your beautiful send-off pictured in your head already. However, wildlife experts caution against such practices. Transported butterflies may arrive dead or sick. They can also lose their way when migrating south from the area to which they are shipped. Importing a non-native species to an area can cause environmental problems for native species. The North American Butterfly Association recommends using rose petals as an alternative. Incorporating your butterfly wedding theme into the reception is relatively easy to do. They can easily be worked into the cake, centerpieces, and favors. 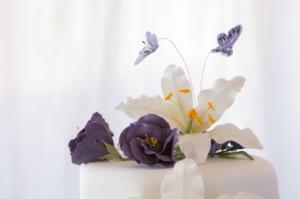 Using a wedding cake topper that has butterflies in it is an easy way to put butterflies on your wedding cake. You could also have your decorator make gum paste or royal icing butterflies and affix them to your cake, or purchase pre-made butterfly decorations and put them on your cake. Place sticks with butterflies on the top into cupcake wedding cakes. Make wedding reception centerpieces unique by having butterflies placed in them. Candles with faux butterflies in the wax can make a great addition. Floral arrangements can always be livened up by placing wire butterflies in them. Make a more unique centerpiece by having a butterfly net hang from the ceilings down over the tables (be sure to check with your reception site for rules regarding ceiling hangings). Have fake butterflies affixed to the sides of the netting and "hanging" in the center of the net using a wire. Make shaped place cards or mats for your wedding rehearsal dinner and use butterfly thank-you notes to keep the butterfly wedding theme throughout all of your wedding festivities.